The area around the ‘Hofplein’ railway viaduct (known as the Hofbogen) has a fascinating history. 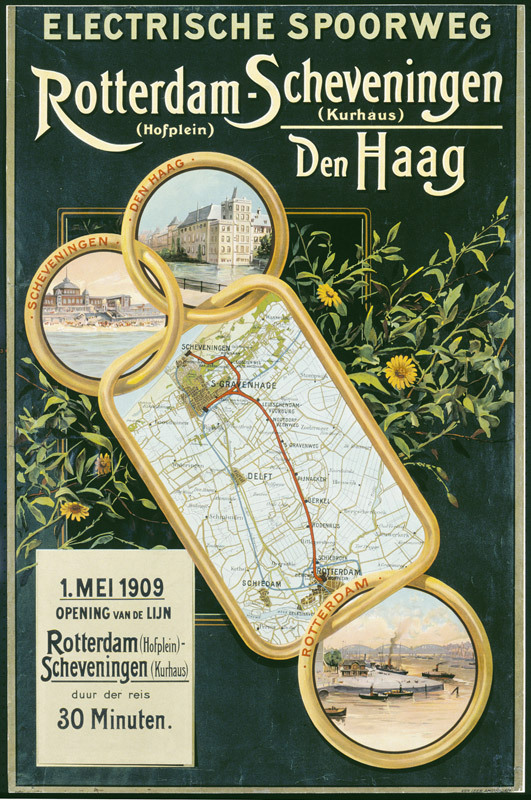 Between 1904 and 1908, the South Holland Electric Railway Company or ZHESM built the Hofplein line connecting Rotterdam Centre, The Hague Centre and Scheveningen Beach, as an alternative addition to the existing main line. In its day, the Hofplein line was an engineering triumph, and the first-ever rail link of its kind in Europe: the journey started over a reinforced concrete viaduct almost two kilometres long, running through Rotterdam North. A specialist concrete company, the Hollandse Beton Maatschappij was founded to realise the first civil project in cast reinforced concrete. What’s more, the Hofplein line was also the very first electric railway line in the country, and would remain so for almost twenty years. The viaduct was first built as an open design; it was closed and leased to tenants to generate income for the viaduct’s construction and exploitation. The structure was made of reinforced concrete to enable the construction of larger spans so that traffic and pedestrians could move freely along the pre-planned roads that ran beneath the arches. Soon after the opening, many of the vaulted spaces were fitted with glass fronts and used as small shops, workshops or cafes. The central Hofplein square, where the line’s terminal station was built in a grand Art Nouveau style, rapidly blossomed into a hub of activity, but was destroyed in the 1940 German bombing raid and never really reconstructed. A new station was erected after World War 2, but was not fully integrated into the main urban activity of the rebuilt city. In the 1990s, interest in the Hofplein and the surrounding area dwindled even further. The spaces below the viaduct were being used as seedy bars and storage areas. Nothing – not even being declared a national architectural monument in April 2002 – could restore the Hofbogen’s reputation. In 2006, four housing associations united to establish a limited company – Hofbogen BV – to buy the run-down viaduct as a joint venture. The company not only purchased the building, but also took on the rental contracts with the remaining contractors. Hofbogen BV fostered grand ambitions. The four housing associations, owners of many residential properties in the area, had great plans to develop the surrounding neighbourhoods. The redevelopment master plan required an investment of 500 million euro. The Hofplein viaduct runs through the entire zone, right through the redevelopment projects. Rail traffic on the line was scheduled to end in 2010. The trains have since been diverted to Rotterdam Central station by a new metro tunnel and no longer use the viaduct. While the run-down viaduct presented opportunities, it also posed a threat. A threat because, by virtue of its size, the dilapidated building had huge impact on the entire area. Nonetheless, the viaduct offered enormous potential: the renovated archways could accommodate the small businesses that aimed to be the lifeblood of the area. Hofbogen BV resolved to refurbish the viaduct to suit the needs of today’s entrepreneurs. From 2007 to 2013, Hofbogen BV commissioned Crimson Architectural Historians to realise the Hofbogen’s transformation. In 2009 a group of local residents formed the foundation ‘Friends of the Hofpleinlijn’ to contribute towards upgrading the neglected line, in sync with the wishes and ideas of the local residents. It was a tough job. Although Hofbogen BV had bought the viaduct and owned the business spaces under the arches, the concrete top belonged to Railinfratrust BV. And there was no point in redeveloping the building without tackling this ‘roof’, which leaked badly in places. However, because the line remained in active use until May 2010, the roof could not be repaired until then. The only section of the roof no longer in service and owned by Hofbogen BV, was the first part of the roof (7 arches, 2500m2) at the Hofplein station. Hofbogen BV decided to tackle this part of the building first, and renovated the arches, some of which were one with another 42 meters deep, redeveloping them as a ‘mini mall’, a place for creative entrepreneurs, sport clubs, bars and food stores. This transformation refurbishment was carried out by PEÑA architecture and Afarai, under the guidance of Cayo van Meurs and Gabriel Raúl Peña. Hofbogen BV initially decided on a temporary solution, a 3-year plan. The area was to become a thriving hub, open 24 hours a day. The roof area was transformed into a stage for dance and theatre productions and smaller festivals. This phase was made possible by funds from the European Union, European Regional Development Fund and even more national and regional funds. The construction of the Luchtsingel, an award-winning wooden bridge designed by the architectural office ZUS (Zones Urbaines Sensibels), offered a remarkable opportunity for the future use of the Hofbogen roof space. The bridge, an elevated walkway, connects the Coolsingel, the Hofplein and Central Station-area with the roof of the Hofbogen. The bridge crosses the intensively-used main railway line from Central Station to the south. In 2012 the Luchtsingel won the Rotterdam City Initiative prize of 4 million euros, when 48% of Rotterdam citizens voted for ZUS’s idea. The project was completed in 2014, and in 2015 the bridge was linked up to the Hofbogen roof. A public park is to be built on the roof of the Hofplein station in 2016. In 2013 the housing associations involved decided on a change of course. They resumed focusing on their core business: building, renting and managing rental properties, mainly houses, for low-income tenants. It was clear that Hofbogen BV required effective, sustainable management. Thanks to a financial boost from the European Regional Development Fund and the Cultural Heritage Agency of the Netherlands, plus a loan from the Dutch National Restoration Fund, Hofbogen was able to refurbish the vaulted spaces and roof of Hofplein Station. From now on the Hofbogen will place greater emphasis on attracting a complementary range of businesses, and entrepreneurs who are tempted by the location rather than the inexpensive lease. The housing associations appointed a new management: Marije Faber was brought in to manage Hofbogen BV and the Rotterdams Ontwikkel Kollektief (RO-OK) was hired to manage the renovation and selling processes. In December 2014, the last ten archway spaces of Hofplein station offering 3.000 m2 of extra commercial space were completed and opened in the summer of 2015. The new concept evokes the area’s bygone grandeur, and the new name, Station Hofplein, brings the glories of the past into the present. A new brand and a new house style, inspired by the early 20th century railway station, drive the new identity. 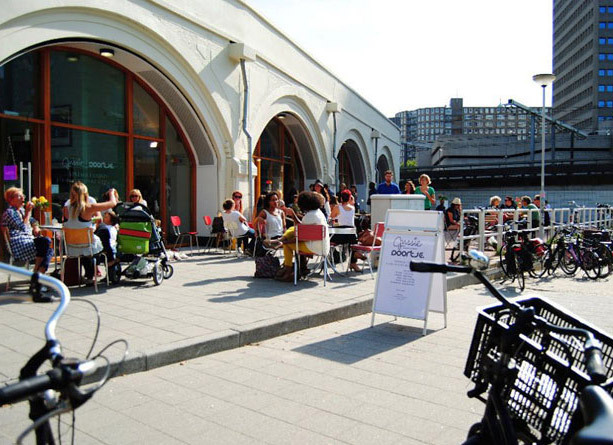 After renovating the roof of the Hofplein station in the summer of 2015, work commenced on refurbishing it as a venue for all of Rotterdam’s inhabitants. A place to enjoy the sun, the amazing views of the city, meet friends, play, or just sit back and relax. Hofbogen BV will complete this stage of the project in partnership with the municipality of Rotterdam. In 2016, the municipality of Rotterdam will develop an environmental and sustainable design for the Hofpleinlijn, the surrounding water, green spaces and streets in the neighbourhood in partnership with Rotterdam-based office De Urbanisten. The next phase will involve the redevelopment of the viaduct as far as the A20 highway, 1.7 km to the north. Railinfratrust BV, the Municipality of Rotterdam and Hofbogen BV recently formed a plan of action. Their aim is to remove all railway fittings such as the rails and overhead power lines this year, and repair the leaking roof. In early 2015, the Polderman Bureau took charge of restoring the viaduct, and JagerJanssen Architects / Jasper de Haan were invited to come up with a design for renovating the Bergweg Station. Polderman conducted a thorough cultural investigation, and is responsible for the governmental licences regarding the restoration of the national monument. The European Regional Development Fund is contributing towards the redevelopment of the most derelict arches on the Vijverhofstraat, and supported the external restoration of the Bergweg Station, which was completed in late 2015. The renewal of this section of the viaduct has significantly boosted the local economy and attracted young and innovative entrepreneurs. Hofbogen BV’s ultimate aim is to sell the entire viaduct, including Hofplein Station. However, Hofbogen BV is committed to handing the property over in good condition. For the moment, this means investing in thriving enterprises, attracting sufficient visitors, and a well-functioning building. With the results of the rapid renovation of this part of the Hofplein line, and the future possibilities of the use of the roof space, the housing associations acquired an excellent reputation for re-valorising the entire building, and add a positive impetus to promoting the sale of the completed viaduct to a new owner. The Friends of the Hofpleinlijn are helping them with publicity, and their search for the right party to take care of the arches and roof of the Hofplein line. The Friends have also initiated a project to bring an original 1914 ZHESM railway carriage from its present location in Germany back home to Rotterdam. The plan is to restore the carriage with a team of railway specialists and local students, and install it as a monument on the viaduct, where it ran every day until 1944. Current plans for its future function – perhaps as a visitors’ centre or a small museum – are being developed. The renovation of the construction and facades of the Bergweg Station finished in January 2016; later this year the 850 m2 will be rented to a new user.